As we were seated, I looked over the menu, which has gluten-free items clearly marked with a red "GF" symbol; see the menu here. I informed my waiter that I was a gluten and dairy allergy, and he told me that he would key the allergy into the ordering system as well as pass on the allergy to the chef. When my food arrived, it was announced as a gluten and dairy allergy order. While looking over the menu, our waiter brought by complementary chips and salsa to munch on. I triple checked before biting into a chip to make sure they were safe, given the all-too sneaky cross contamination of shared fryers. Luckily, Antojito's fries all of their chips in one dedicated fryer, which means they are all gluten-free. Once cleared for safe consumption I was excited that these were safe for me, because so often chips are not. The chips are crunchy, lightly salted, and thick enough to scoop up a decent amount of salsa without breaking. The salsa was chunky and fresh, not the most amazing salsa I have had, but a notch above what you can find in an average grocery store. The only downside is pacing yourself so as to not overload on chips and salsa before the entrees arrived. For my entree, I ordered the enchiladas verdes. 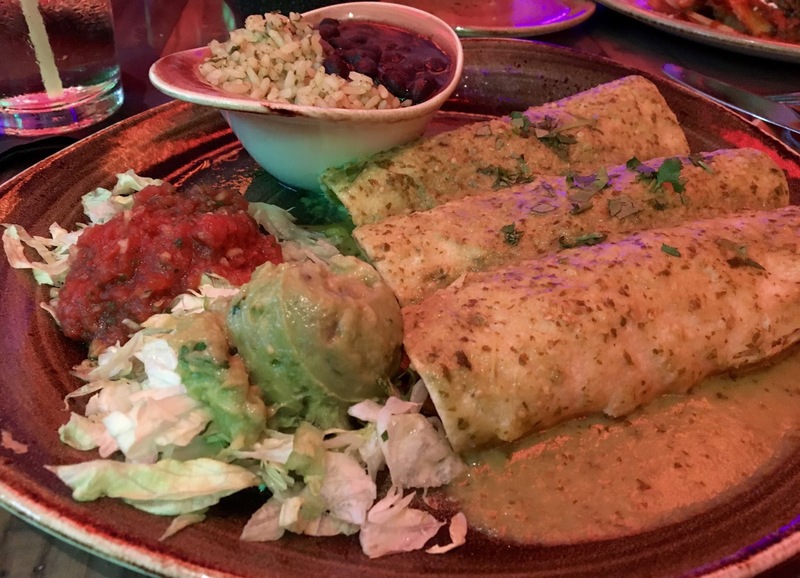 When the waiter brought it out, I was impressed by the sizable portion of my meal, featuring three enchiladas, rice and beans, and shredded lettuce topped with a dollop of salsa and guacamole. The enchiladas were simply amazing; corn tortillas wrapped tender, slow-roasted, spicy chicken and were topped with a generous helping of flavorful salsa verde. The beans were spicy and stewed, the rice a nice neutral palate cleanser to balance the vibrant flavors. The shredded lettuce, while seemingly an after thought also served well as a cooling presence to beat the heat. Normally not a guacamole person, I tried the small portion and licked to creaminess and inclusion of tomatoes and onions into the mixture. Overall, I loved the variety of foods on the plate and found the fare far better than typical theme park food. 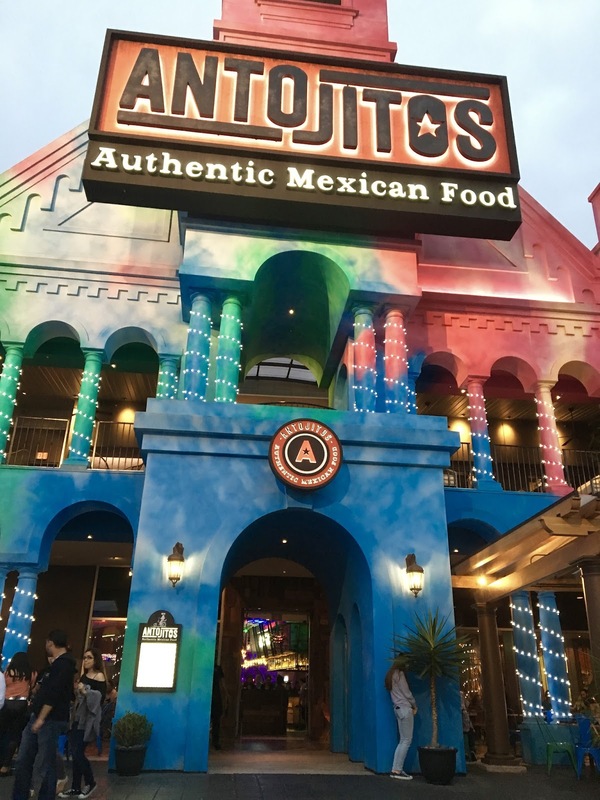 I definitely would return to Antojitos again, especially since I don't need a pass to grab a meal there. For $16, I was satisfied by the amount and quality of food served up, and little luxuries such as safe complementary chips. The atmosphere was buzzing and the menu definitely has plenty of options for dining parties with varying tastes and dietary needs. While service was not overly attentive, our waiter did take care of my dietary restrictions. Want to read about more Universal Orlando gluten-free dining options? Click here to access all of my Universal posts. Special Features: Universal annual pass holders can receive a discount on food. A live mariachi band performs nightly.